Dad had this photograph taken in the late 60's or early 70's at the Miller Photographic Studios in Avon NY. 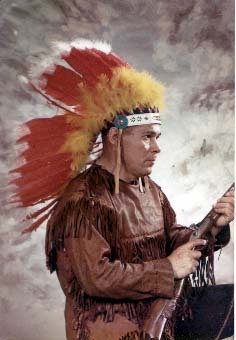 Although the costume isn't traditional Mohawk, it does represent the fact the though he raised his family in the white world, the Iroquois world was never completely hidden. Our Mother, though white, made sure we never forgot our Mohawk heritage.